It’s been a long road, getting from there to here… oh wait, wrong Star Trek show. CBS has also released some gallery photos as well as some gorgeous poster art for the series which you can find below. Underneath that, find the first trailer. 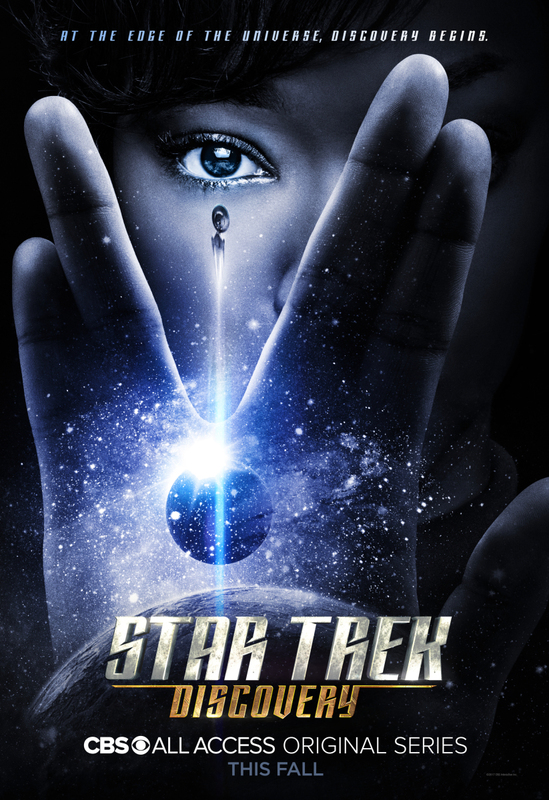 Confirmed cast for Star Trek: Discovery includes Sonequa Martin-Green (First Officer Michael Burnham), Doug Jones (Lieutenant Saru), Jason Isaacs (Captain Gabriel Lorca), Shazad Latif (Lieutenant Ash Tyler), Anthony Rapp (Lieutenant Paul Stamets), Michelle Yeoh (Captain Philippa Georgiou), Mary Wiseman (Cadet Sylvia Tilly), Chris Obi (T’Kuvma), Mary Chieffo (L’Rell), James Frain (Ambassador Sarek), Rainn Wilson (Harry Mudd), Terry Serpico (Admiral Anderson), Maulik Pancholy (Doctor Nambue),Damon Runyan (Ujilli), Rekha Sharma (Commander Landry), Kenneth Mitchell (Kol), and Clare McConnell (Dennas).